After a series of ousters from the White House, who might be next? It seems at times like a reality television show. President Trump has ousted more than two dozen members of his administration, creating the impression of chaos and a guessing game of who will be next. Most of the casualties have been senior aides — remember Stephen K. Bannon and Anthony Scaramucci? Of his original Cabinet — positions requiring Senate confirmation — three have been ousted: Tom Price (head of Health and Human Services), Rex Tillerson (secretary of State) and, last week, David Shulkin (Veterans Affairs chief). Why he might go: He’s been relatively quiet since Trump took office, but that recently changed. Carson’s wife ordered a dining room set for his office that cost the Department of Housing and Urban Development $31,000. The furniture order has since been canceled. Why she might stay: She and Trump have been in lockstep on whether to arm teachers since the Feb. 14 school shooting in Parkland, Fla. Last month, Trump tapped her to head a school safety commission to explore how to prevent mass shootings. Why she might go: Bad ratings. She’s often greeted by protesters — primarily teachers unions — due to her support for charter schools, which are publicly funded but run outside state school systems. She was ridiculed for a “60 Minutes” interview in which she gave vague answers on school choice, college sexual assaults and other issues. Why he might stay: He’s a retired four-star general, and Trump has said he likes generals. Since he became chief of staff in July, Kelly has sought to bring order to the West Wing, which Trump reportedly said was needed. In public, Trump says he likes Kelly. Why he might go: In private, Trump is reportedly souring on Kelly. In recent weeks, Trump has complained that the structure in the West Wing doesn’t suit the freewheeling style he used as a businessman, according to several news outlets. Kelly made negative headlines recently when he acknowledged he mishandled accusations of domestic abuse made by ex-wives of Rob Porter, who resigned in February as staff secretary. Why he might stay: He’s a general. Trump has largely avoided confrontation with him and stayed out his way, and has made concessions at Mattis’ request. Last month, Trump signed a spending bill after threatening a veto. Mattis was vocal in his support for the bill because it boosts Pentagon funding. Why he might go: His allies are leaving the administration. It was recently announced that Rex Tillerson and H.R. McMaster will be relieved of their duties as secretary of State and national security advisor, respectively. 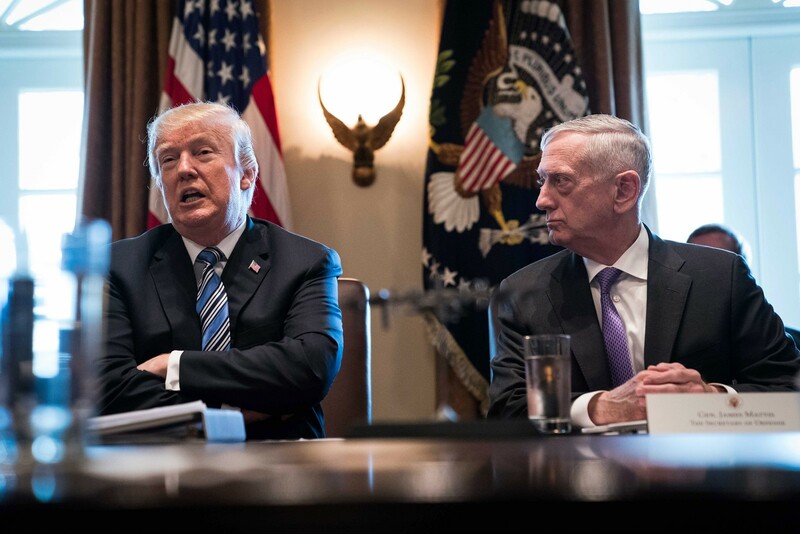 Mattis has also split with Trump on issues such as North Korea and Iran. If he becomes more vocal, that could lead to his departure as well. Why he might stay: Like Trump, Mnuchin is a rich New Yorker, and he has defended the president’s policies relentlessly. At a gathering of global economic leaders last month, he faced a barrage of questions about plans to hit other countries with stiff tariffs on aluminum and steel, and never backed down. Why he might go: He’s been in the news for all the wrong reasons. Last summer, he took a military jet from New York to Washington, saying he needed a secure phone line. The flight cost at least $25,000, ABC News reported. He and his wife also drew criticism for taking a government plane to Kentucky, where they viewed the solar eclipse. His office said it was official travel — Mnuchin attended a luncheon and visited Ft. Knox — and said he would reimburse the government for his wife’s costs. Why she might stay: She is a staunch defender of the president, willing to battle reporters on issues like the Russia investigation and Trump’s alleged affair with Stormy Daniels. Unlike predecessor Sean Spicer, she has avoided drawing her boss’ ire. Why she might go: Trump is his own spokesperson. At any moment, he could become upset with her performance and oust her. Why he might stay: Firing Sessions could open a legal morass. Special counsel Robert S. Mueller III, who is investigating possible collusion with Russia, is reportedly looking into whether Trump tried to pressure Sessions to resign and whether that would help make a case for obstruction of justice. Firing Sessions could also ignite a strong response in Congress, where many Republicans are very supportive of the former senator from Alabama. He’s also been willing to implement some of Trump’s most controversial policies, including a travel ban targeting nationals of several majority-Muslim countries. Why he might go: Since Sessions recused himself from the Russia inquiry last year, Trump has assailed him relentlessly. “So why aren’t the Committees and investigators, and of course our beleaguered A.G., looking into Crooked Hillarys crimes & Russia relations?” Trump tweeted last summer. At some point the humiliation “may just be too much to overcome,” Schmidt said. Why he might stay: He is also a loyalist. The former congressman from Montana was an early supporter of Trump’s presidential bid. And he’s the point man for Trump’s widely touted plan to expand offshore drilling. Zinke and Trump have released a proposal to open for exploration the largest expanse of the nation’s offshore oil and natural gas reserves ever offered to global energy companies. Why he might go: Zinke has amassed bad headlines. In October, an investigation was launched after reports that he chartered a $12,375 flight from Las Vegas to an airport near his home in Montana, where he spent the night.